Been a busy year with too many life moments that unfortunately left less room for writing, and thus dates kept getting pushed back. 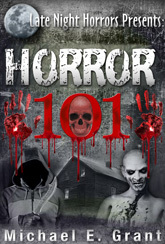 Finally though I finished up Horror 101 and that is now available on all ebook retail sites. I’m also 75% finished with the sequel to There Goes Tokyo, fittingly titled There Goes Tokyo 2! In 1985 Toho Studios created the Heisei Series unveiling a totally new era for all of their gigantic monsters from the 1960s. The success of these new movies would later lead to Toho’s Millennium Series and an entire new generation of Kaiju Eiga greatness for fans to experience on the big and small screens across the globe. Continuing his madcap affection for any monster large enough to stomp on a pagoda, author Michael E. Grant (In 666 Words, Horrors 101) serves up a second selection of reviews celebrating Kaiju Eiga. 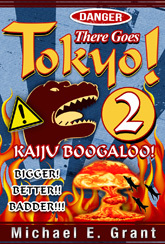 There Goes Tokyo 2: Kaiju Boogaloo pays homage to some of the great (and not so great) sequels and giant monster mayhem from 1985-2014 as well as the debut of Legendary’s newest Godzilla movie. There Goes Tokyo 2! is another humorous love letter from a fan of the Showa Series who is getting his first introduction to the Heisei Series, Millennium Series, and Beyond! Beyond this book and the, just finished Horror 101, I am about one-third finished with my first full length novel. If all goes well I will be able to release the cover and some additional information about this work in the Spring of 2015. Trust me, if you enjoy zombies then you’ll love this one. It’s been a blast to write as I get to play around with the zombie genre and fill in all the nagging holes that surround the general concept. The 1960s and 1970s a time when a proliferation of American television programs aired the seemingly never ending treat of Kaiju Eiga (giant monster movie). In a time before instant viewing, every weekend creature feature shows unleashed an array of towering city-stomping terrors with names like: Godzilla, Rodan, Mothra, Kong, Ghidorah, and Them! Skyscrapers were toppled! Panic filled the streets! And fans of a good monster romp enjoyed every thrilling moment of the spectacle! In this collection numerous monster movies of yesteryear are reviewed and reflected upon to see what their appeal was to one child and how well that attachment still lasts forty years later. Classics like King Kong, Godzilla vs. Monster Zero, and War of the Gargantuas are detailed and honored with full appreciation. Less memorable faire such as Godzilla vs. the Smog Monster, Frankenstein Conquers the World, and King Kong Escapes are thoroughly skewered (and deservedly so). In all, 23 monster movies from Japan and America are analyzed by one true fan who still realizes the unmatched excitement of a destroyed Pagoda. There Goes Tokyo! 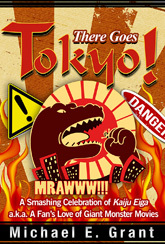 is a 280-page humorous love letter from a fan of Kaiju Eiga for fans of Kaiju Eiga. Available now for the Kindle. This very website went LIVE! Don't forget to bookmark us. The ebook IN 666 WORDS is available! Buy your copy today. What’s the deal with In 666 Words? In 666 Words is my first released ebook. It contains 34 horror stories all in exactly 666 words. The ebook also comes with a bonus story from my second full length collection LATE NIGHT HORRORS which will be available near the end of 2012. How is Horror 101 different from In 666 Words? The stories in In 666 Words were each 666-words. The “burst” stories in Horror 101 are exactly 101-words. Horror 101 also has four regular length short stories which helps the book fulfill a longer page count and better reading experience for fans. Beyond that, both books work very well with each other as there’s some decent scares, brutal imagery, and I feel each work is a nice homage to the comic book stories of EC Comics Tales from the Crypt. 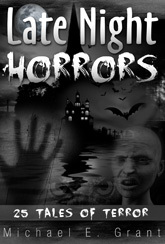 Why does the cover of In 666 Words say, “Late Night Horrors Presents…”? I actually wrote 50% of Late Night Horrors before sidetracking to In 666 Words (I found the confined story-length an interesting challenge). However, as a fan of all things horror, my overall goal was to release a wide assortment of titles all under one banner so the reader knows what they’re getting into. Late Night Horrors worked best so thus the title for Book #2 became the title of the franchise. Will your book LATE NIGHT HORRORS ever be available? The short answer is YES. There were some stumbling blocks with Late Night Horrors that slowed up my ability to release it. This begins with me using the book to try and get formal representation. Sadly, horror short fiction is a poorly selling market so I was met with nothing more than requests for a full-length novel. Then as I worked on In 666 Words and Horror 101 I ended up pillaging a story or three from Late Night Horrors because the tales fit the format of the other book better. This took Late Night Horrors from 25 Tales of Terror to 22! So, on my agenda is to add three new stories and have LNH released as my sixth book. Before then I will release There Goes Tokyo 2! and my first full-length horror novel. I can’t offer more on the book than to say it has zombies and an original take that combines some great elements from other genres. I read a ton of horror genre and watch my share of horror themed movies and TV shows. A majority of my ideas stem from thinking of things that I would NOT want to have happen to me ever! Once I have an idea I write/type it and store it for later reflection. It’s a great tip for all up-n-coming writers. Write down your ideas so you don’t forget them and so you don’t waste valuable mental energy trying to remember them. My mind tends to think of 9-10 ideas each day…1 or 2 of them are “keepers”. For In 666 Words, I started with 50 scary ideas with about a one sentence concept each. Then I whittled them down to the best 30 and started writing. As I worked on the collection, four new ideas came to mind and I decided to include them. It looks like some of the stories & characters from IN 666 WORDS intersect. Was this intentional? Thanks for noticing! Yes it was. I won’t spoil things and point out all of the stories that do involve similar “worlds” or characters, but if you take the time to read each of the stories from In 666 Words, you’ll start to see names and places. The easiest (or hardest depending on your reading speed) to spot is the first story A SIMPLE PICNIC and the final story 7:15PM are connected showing the viewpoints of a husband and wife…and the results of a dinner date that do not go so well. What’s going on with the book LATE NIGHT HORRORS? Funny you should mention that as I am currently working on it. Originally Late Night Horrors was to be my first title available. However the length of the stories kept growing and a collection of 25 Tales of Terror is now pushing 400+ pages and counting! In the midst of writing I penned a story called IN 666 WORDS and that got my creative energy flowing towards flash fiction for a time with the obvious result. Rest assured Late Night Horrors will be completed and on sale in 2014. Why are you watching all these Godzilla movies? Ok, in all fairness that question was asked by my wife. I spent the summer watching 23 kaiju (or giant monster movies) and penning some humorous reviews and reflections on each of them. It’s amazing to see how my opinions on each have either improved or not with age. The collection THERE GOES TOKYO! is currently at my editor and should be available in either October or November 2013…depending on how well my editor likes monster movies…and my jokes. Are you ever going to review Godzilla movies from the Heisei and Millennium Series? Yes! My second Kaiju Eiga collection – There Goes Tokyo 2! is currently being written. As of October 2014, I have finished the entire run of the Heisei Series and the Millennium Series and am working on about ten bonus reviews to really add some fun to the collection. At this point there will be 35 total movies reviewed in this second collection. And before anyone asks, I already have the building blocks for a third entry in my ongoing lovefest for Kaiju Eiga as well as a new horror movie review book on the backburner. From the Showa Series my favorite movie is GODZILLA VS. MONSTER ZERO (a.k.a. INVASION OF ASTRO-MONSTER) there is so much to enjoy with this movie and Toho was successfully firing on all cylinders. Non-Godzilla movie from the Showa Era is WAR OF THE GARGANTUAS, also too much fun and entertainment for one movie to contain. The two make a great afternoon double feature and also allow for the comparison of acting styles between Americans Nick Adams and Russ Tamblyn. Did you enjoy the new Godzilla movie that came out this summer? Yes! I saw it twice. The first time I smiled and enjoyed the movie from beginning to end. The second time I was working on gathering notes for this movie’s inclusion in There Goes Tokyo 2! You can find my entry on my experience taking notes in a dark theatre (and pictures) on my regular blog www.barreljumper.com. All things considered, I thought the movie was a solid ‘B’ and it only needed a few tweaks to make it more memorable. Based on what I have read Legendary Studios has heard the grumbles from the masses and will most likely fix all the concerns for the sequel in a few years. It says in your Author Bio that you play Donkey Kong every day, is this true? More or less. I have been a fan of Donkey Kong since my exposure to it when I was twelve. It’s a hard game, but one that is very rewarding when a solid score is earned. The King of Kong (for all it’s minor flaws and reworkings of the truth) is a movie very near and dear to my heart. That movie helped motivate me to build my own home arcade machine from a beat-up old cabinet I purchased for $20. That machine is now complete and most days I load it up to play some Donkey Kong. I have topped one million points a few times during play and am half-heartedly pursuing a shot at the World Record. Who designs the covers to your books? Do you have a favorite? Derek Chiodo has designed the covers for all of my books (including several not fully completed). He is a great designer and offers fair prices and an incredibly fast turn around. Working with Derek allows me to submit my vision for a cover, to see his, and then to adjust and debate the finer details. I love all of his work but my favorite is the cover for There Goes Tokyo! My wife and I loved it so much we framed it in our living room alongside some smaller Showa Era movie posters (Gojira, Son of Godzilla, War of the Gargantuas, and Godzilla vs. Monster Zero). This was an honest to God real question…and it came in an email that was empty beyond the question…I could not help but have flashes to Misery. Anyways, my #1 Fan has to be Nicole B. who I made contact with after her review for In 666 Words. We began communicating regularly after that. I sent her some of the stories from Horror 101 prior to publishing for the input of an avid reader. Nicole is not the only reader I have connected with though and it means a lot to me when I read reviews and receive emails, whether good or critical, those connections help hone my skills as a writer. That said, I hope people keep sending along more questions. An escalating game of Rock-Paper-Scissors is played to an unexpected conclusion. A blind date between two werewolves does not have a happy ending. The middle school science fair has a frightening entry vying for first place. A parking garage holds a special surprise for one late night visitor. HORROR 101 serves up these tales and plenty of others on a devilish platter of gruesome imagery. Author Michael E. Grant (In 666 Words) returns to the realm of frightening flash fiction for thirty tales delivered in shocking bursts of precisely 101-words. All of the classic horror staples are present from vampires, serial killers, wicked children, the worst teddy bear on the planet, and a whole lot of people finding themselves in the wrong place at the wrong time. Monsters 101, two young boys stumble across an ancient monster hiding in suburbia. Stranger, a mother comes to grips with the unbelievable story of her son’s abduction. The 10-Step Zombie Defense Plan, where zombie strategy does not guarantee victory. Joining the Parade, a children’s television program has a special showing where adults are not permitted. School is in session and it’s time for you to experience all of these terrifying stories served up in shocking short bursts. In this collection numerous monster movies of yesteryear are reviewed and reflected upon to study their appeal for one child and how that attachment still lasts forty years later. With all of the hype surrounding the 2014 theatrical Godzilla remake, it's important to reflect back on the origins of the giant monster genre. The 1960s and 1970s, a time when a proliferation of American television programs aired the seemingly never ending treat of Kaiju Eiga (giant monster movie). Decades before instant viewing, every weekend channels aired creature feature shows that unleashed an array of towering, city-stomping, terrors with names like Godzilla, Rodan, Mothra, Kong, Ghidorah, and Them! Skyscrapers were toppled! Panic filled the streets! And the fans of a good monster romp enjoyed every thrilling moment of the spectacle! Classics like King Kong, Godzilla vs. Monster Zero, and War of the Gargantuas are detailed and honored with full appreciation. Less memorable titles such as Godzilla vs. the Smog Monster, Frankenstein Conquers the World, and King Kong Escapes are thoroughly skewered (and deservedly so). In all, 23 classic movies from Japan and America are analyzed by a true genre-enthusiast who still thrives from the unbridled excitement of seeing a giant monster destroy a pagoda. 666 - It is the number that should invoke fear in all of us. Does it frighten you? Somewhere lurking within these 33 tales of flash-fiction true terror exists for those brave enough to read on. Travel along with; a generations spanning cannibal clan eating their way through America to serial killers crossing paths on deserted train tracks to those unfortunate souls who have come face-to-face with the Devil. If that’s not enough, you’ll encounter vampires, giant insects, carpet-dwelling aliens, beautification procedures gone awry, soul-selling death metal rock stars, the darkest corners of science, and the extremes of parental punishment. In 666 Words presents each pulse-pounding offering in a “hit them fast and leave them terrified” jolt of precisely 666 words. It’s an ode to the classic genre stories that used to inhabit the comic books and magazines of the 1950’s and 60’s. Unless you already suffer from hexakosioihexekontahexaphobia, prepare for scares! 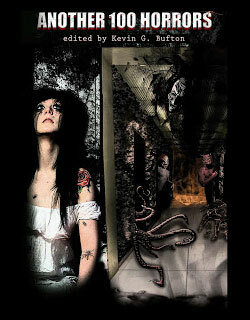 This 30,000 word book also includes a complete short story from the upcoming full length collection Late Night Horrors. Michael E. Grant lives a mostly scare-free life with his wife, 3 cats, 2 dogs and a tank full of fish. In his spare time he goes to the movies, watches too much TV, plays Donkey Kong daily, and carries his iPad with him at all times. 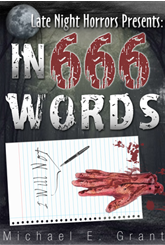 In 666 Words is his first collection of horror fiction. Currently he is completing 25 full length stories in LATE NIGHT HORRORS (available in 2014) as well as working on more stories to scare. Reviews of his work are always welcome. All reviewers should check out the Monthly Poster Contest on this very site! Please spread the word and thanks for reading! *Look for this great collection of horror flash fiction where 100 writers created 100 stories each in exactly 100 words. It’s a perfect fast read that provides some excellent creative views of what “horror” truly means. My contribution THE BACKSEAT CHECK is included. It took longer than expected to get the Late Night Horrors Poster Contest started. While I have received several emails directly, the contest stipulation requires that a formal review be posted to a site where my work is available for sale and then sent in for contest entry. At this point I am happy to announce our first latest winners (and your posters will be in the mail). Before going any further I should probably state that I am one of those annoying know-it-all Godzilla fans who actually knows how to correctly spell Sadamasa Arikawa and knows who that is. Having been raised on G-films (and perhaps just not knowing any better) I also never guffawed at the so-called bad dubbing and rubber suited monsters. That all being said, Michael E. Grant’s There Goes Tokyo was an absolute riot that nearly had me rolling on the floor laughing at times, intentionally mind you. It was as if my other favorite comedic author (Forrest Griffin of Got Fight?) had written a book on Godzilla. In case those last two sentences were too subtle, I’m saying this is one funny book. Granted, the serious “Gojira” fans would be inclined to have a nuclear hissy-fit if they ever read There Goes Tokyo, and I would seriously suggest that this author never try to promote himself or the book at the annual G-Fest Godzilla convention, but as a serious well read fan of the G-series I had a blast delving into this book. In fact, I like it so much that were it to ever become available in print I would actually buy a copy so that I have one on hand when the system fails and the world inevitably reverts back to the stone age. If you’re not too much of an up-tight G-Fan I would seriously consider reading this book. Grant’s musings on the films range from topics such as reporter Steve Martin’s future as a bloated chain smoking know it all forcing everyone he meets to listen to his story about the time he survived Godzilla to analyzing Ichiro’s (the little boy from Godzilla’s Revenge) numerous psychological issues. All in all, like one of the three rules for Kaiju Films I’d say that laughing out loud is mandatory when reading this book. Poring over these tales felt like watching the Twilight Zone. And I can even picture Alfred Hitchcock introducing episodes based on Michael's work. If you like bizarre stories that do not beat about the bush, this book's for you. Each tale is exactly 666 words long (a challenge majestically executed, by the way), nevertheless Michael's scope is wide enough, even within such margin, to give us a fair account of the uncanny events herein related so that the number of words employed in the process becomes a matter of no consequence whatsoever. Now, as to my favourites, should anyone else wish to discuss them, those are: Sketches, Under the carpet, The copier from hell, The hit, Small step back, Stalled, and Family dinner. This volume also seems like the prelude to a new anthology stemming from the issues here broached - just my thoughts, mind you. In any case, it won't surprise me when some of Michael's stories are adapted for the big screen. In 666 Words is a fantastic quick read that offers a little something for everyone's tastebuds...including human bbq! The fact that some of the stories tied together made the book even more interesting. At times there was the feeling that a story ended early, and then three stories later you find that it continues and becomes even more horrifying. Along with the gruesome, chilling, and baffling, there is an underlying sense of humor that will tickle your funny bone in the most unexpected places. This book has been a wonderful addition to my collection, and I look forward to reading more from Michael E. Grant. Happy Hauntings! I’d love to make connections with you, the reader, so I will be giving away 1 autographed 20” x 30” poster each month to those who submit reviews of IN 666 WORDS to Amazon or Barnes and Noble. To enter the contest, simply write a review on either website and, then email mike@latenighthorrors.com with a copy of your review. Each month one reader-reviewer will be randomly selected for the prize. Those not chosen will remain in the contest and be eligible each month for the poster or other prizes. Check the website for full details. Winners will be announced at www.latenighthorrors.com. Reviews do not need to be in 666 words, and they don’t need to be positive to win. However it’s hard to imagine you’d want an autographed poster for an ebook that you didn’t enjoy.